Moscow- Head of Syrian regime Bashar al-Assad received Tuesday Russian Defense Minister Sergei Shoigu at the instruction of Russian President Vladimir Putin, the Syrian presidency said in a statement. “During the meeting, the issues of military and military-technical cooperation were discussed in the context of the successful actions of the Syrian government troops with the support of the Russian Aerospace Forces aimed at the complete destruction of ISIS in Syria,” the Russian Foreign Ministry said in a statement. 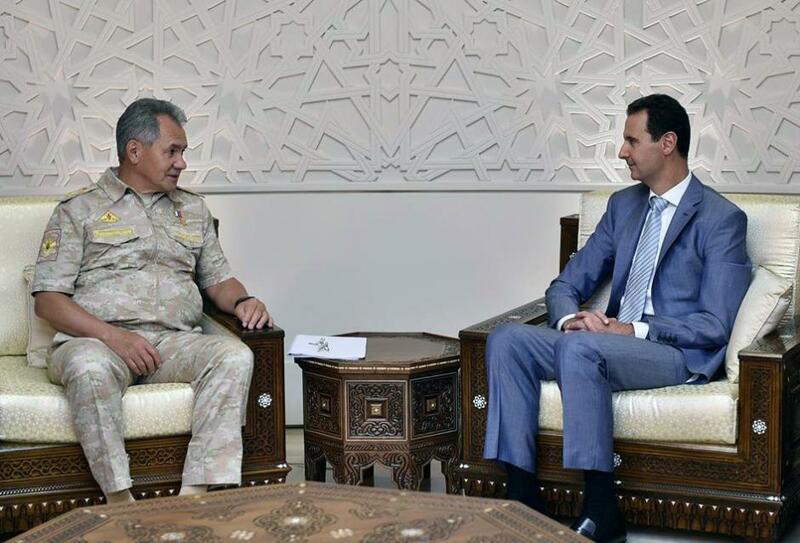 Shoigu and Assad also discussed issues of stabilization of the situation in Syria, the functioning of de-escalation zones, and humanitarian assistance. Meanwhile, Kazakh Foreign Minister Kairat Abdrakhmanov said Tuesday that the representatives of the Syrian armed opposition will actively participate in the upcoming sixth round of the talks on the Syrian settlement, which will be held in Kazakhstan’s capital of Astana. “Representatives of the Syrian armed opposition have made official requests to Kazakhstan’s consulates asking for entrance visas. This means that representatives of the Syrian armed opposition will actively participate in the next round, like the last time,” the Foreign Minister told reporters. According to Abdrakhmanov, groups that represent the Southern Front will participate in the sixth round, as well as other groups, which had been part of the Astana talks since their beginning. “The Jordanian side will also participate as an observer and will be represented by highly placed officials from their external affairs departments,” the Minister said. The establishment of the fourth and the last zone of de-escalation of violence in Syria, namely in its northern Idlib province, is going to be in the spotlight of the upcoming high-level international meeting on Syria in Astana. The talks, attended by high-ranking officials from the three ceasefire guarantor states — Russia, Iran and Turkey — as well as representatives of the Syrian government and armed opposition, will be held on September 13-15. So far, three zones of de-escalation have been established: in the south along the border with Jordan, in Eastern Ghouta and to the north of Homs. Consultations on the fourth and most problematic de-escalation zone in the Idlib province are ongoing. In July, Russia, Turkey and Iran, with help from Jordan and the United States as observers, tried to coordinate a whole range of specifics on the establishment of the four safe zones, but could not agree on all the details and sign the package of documents as a whole. Since July, three out of four zones were coordinated and announced outside of the Astana framework.